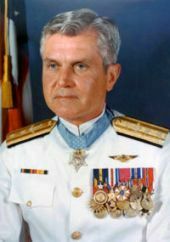 Admiral James B. Stockdale was one of the most highly decorated officers in the history of the U.S. Navy and the only Navy officer of his rank ever to wear both flying wings and The Congressional Medal of Honor. Stockdale was born on Dec. 23, 1923 at Galesburg Cottage Hospital. He grew up in Abingdon, Illinois in Knox County, a town of about 2,800 people 50 miles west of Peoria. His parents were Vernon and Mabel Stockdale. Vernon was a self-made man who owned a farm and was Vice President of Abingdon Potteries where he supervised Italian artisans. "Stock" as the senior Stockdale was known was a Navy veteran of the First World War. In 1935, Stock took 11-year old James to hear a commencement speech by Admiral Richard Byrd at Iowa Wesleyan College. Byrd was a world-famous hero like Charles Lindbergh in the 1930s for his exploits in Antarctica including the fact that led a crew that was first to fly over the South Pole in 1929. James was very impressed with Byrd and Byrd became a role model. From that time, Stock decided that the U.S. Naval Academy would be a goal for James. James Stockdale lettered in several different sports including football at Abingdon High School but he also loved music. His mother was a former school teacher who encouraged him to try everything from music classes to parts in school plays and even plays for her chapter of the Daughters of the American Revolution (DAR). James won a regional piano competition while in high school. After graduating from Abingdon High School in 1942, Stockdale was on a waiting list for an appointment to the U.S. Naval Academy and took classes at Monmouth College and nearby Knox College in Galesburg. James entered the Naval Academy in the fall of 1943 and graduated in 1947. Right after graduation he married Sybil Bailey from Connecticut and they reported to Pensacola, Florida. The couple eventually had four sons. In 1954 he was accepted for pilot training at Petauxent River, Maryland where one of his flight training classmates was future Mercury astronaut and U.S. Senator John Glenn. On August 2, 1964, Stockdale fired some of the first shots near North Viet Nam in the Gulf of Tonkin. He said later that the second Gulf of Tonkin incident was a false alarm and there were no boats for American ships to fire at. But on Aug. 5, under direct orders from President Lyndon Johnson, Stockdale led the first attack on North Viet Nam and planes under his command blew up an oil storage farm at Vinh City. On Sept. 5, 1965, Capt. Stockdale's A4E-Skyhawk fighter plane was hit by enemy fire and he ejected over North Viet Nam. He spent the next seven and one-half years of his life as a prisoner of war in the Hoa Lo prison, also called the Hanoi Hilton by Americans. Four of those years were in solitary confinement because he refused to cooperate with interrogators. He even inflicted bruises on himself as an act of defiance so that he would not be used in propaganda newsreels. He felt a special duty to set an example because he was the highest ranking officer in captivity in North Viet Nam. While he was in captivity, his wife Sybil Stockdale formed the American League of Families of POWs and MIAs along with other wives of prisoners and missing soldiers and pilots. The group agitated for the American government to acknowledge the mistreatment of American POWs by North Viet Nam which was not done until 1968. It was during this time working with the League of Families that Sybil met H. Ross Perot, the wealthy Texan who owned EDS and who gave money to support the League. Stockdale was finally released along with other POWs in February 1973 as a result of the Paris Peace Talks. He was given the Congressional Medal of Honor in 1976 and many other decorations for bravery including four silver stars. His last active duty assignment in the Navy from 1977 to 1979 was as President of the Naval War College. After retirement from the Navy in 1979, he became President of The Citadel military college in Charleston, South Carolina. Stockdale's last appearance on the public stage was an unhappy experience and in some ways a very unfair one for someone who had given so much to his country. Due to Sybil's friendship with Ross Perot, James agreed to be a place-holder candidate for Vice President of the United States on a ticket with Perot until Perot got a replacement for his campaign in 1992. Stockdale never thought his name would actually be on the ballot and he did not think he should be a running mate for Perot at age 68. Perot changed his mind several times about running. But Perot finally got back into the race in the fall and Stockdale had one week's notice that he would be in a TV debate with Vice President Dan Quayle and Sen. Al Gore on Oct. 13 in Atlanta, Georgia. When his turn in the opening statements came, Stockdale asked the rhetorical questions "Who am I? Why am I here?" It was his intention to answer his own questions with a biographical introduction of himself since his background was so different from careeer politicians Quayle and Gore. But the inflection of his voice was stiff and his time ran out and he looked confused to the audience and reporters. Later in the debate he had to ask a reporter to repeat a question because his hearing aid was not set correctly. All this added to the impression of a senile and confused man which was not the case for those who knew him and reporters who interviewed him in other situations. The Perot-Stockdale ticket won 19 percent of the national popular vote and no electoral votes in a three-way race. Bill Clinton and Al Gore won with 43 percent of the vote and 370 electoral votes to 37 percent and 168 electoral votes for Bush and Quayle. Abingdon,Illinois-native Admiral James Stockdale retired to Coronado, California and died on July 5, 2005. He was buried on the grounds of the U.S. Naval Academy at Annapolis. On January 12, 2006, Admiral Michael G. Mullen, Chief of Naval Operations, announced at a conference in San Diego that construction will soon begin on the USS Stockdale (DDG 106). The USS Stockdale will be an Arleigh Burke class guided missile destroyer. Mrs. Sybil Stockdale and her son Dr. James B. Stockdale, Jr. were present for the announcement.